After a dawn start then a four-hour train ride from the beautiful new Kempinski Hotel River Park in Bratislava to Štrbské Pleso in the heart of Slovakia, I was praying that Kempinski’s first spa by Resense would lift me from zombiedom. Prospects immediately looked up as a waterfall-flanked staircase led me down to Kempinski The Spa – a vast expanse of elegant boudoir chic, biscuit marble and drooling chandeliers. But it was the handsome High Tatras mountains reflected in Lake Štrbské that stole the show. Mesmerised by these peaceful snow-capped peaks, I have no idea how many lengths of the pool I swam, whereas usually I impatiently count the laps. Moments later, resting on a cream chaise longue in the spa’s lakeside relaxation room, I marveled at how apt it was that a hotel spa set in such scenic nature should offer treatments based on a person’s ‘seasonal type’. Snatched from my reverie as I realized I was meeting the gaze of ruddy-cheeked alpine hikers plodding past the vast windows, I drew my dressing gown tighter and sought refuge in the spa’s wet area, complete with Caldarium, Finnish sauna, salt steam sauna and tropical shower. The pebble-bottomed Kneipp’s Way footbaths were a unique touch but nobbly to walk on. “No pain no gain” I muttered between clenched teeth, and again later as I fizzled for exactly 0.5 seconds in the glacial post-sauna plunge pool, emerging tingling and triumphant as an Antarctic surviver. Altogether more soothing was my 90-minute ‘Stimulating’ Winter Warmer massage, chosen because it was a cold wintery day in autumn. But my therapist Pavol (in my book, the ‘Federer of massage therapists’ when it comes to flawless textbook technique) obligingly used the Autumn body oil, as I have a sluggish circulation and preferred its lemongrass scent. So huge were his hands that at one stage I thought he was walking over me with his feet! Yet for someone strong he was also gentle when required, faultlessly ticking all the spa etiquette boxes (raising the towel high for privacy; adapting the pressure to my needs; placing an eyemask on when I faced upwards; not chatting when I wanted to doze). My one lament was not staying for longer in this enchanting hotel, having taken so long to reach it (fear not, private jet owners, it has a heli-pad). This restful alpine retreat will appeal to anyone from the spa-obsessed to alpine walkers, skiers, burnt-out execs, cosy couples and castle-loving culture vultures. The adventurous can even go bear-watching in the mountains! Ideal for those who insist on mountains of luxury and top-level service – qualities for which Kempinski is clearly at the summit. Manifestations: Difficulties adjusting to seasonal changes; sensitive to light; emotional; euphoric; fluid retention; easily disoriented or light headed. Manifestations: Excessive body heat; skin problems; hormonal imbalance; high energy; quick tempered with a need to cool off. Manifestations: Sluggishness; asthma or breathing problems; weight gain; tendency to sadness and tears; introspective. Manifestations: Dry skin and nose/throat/lung membrane; difficulty awaking in the morning; sense of heaviness in the body; stiff joints and muscles; easily depressed. Bespoke and seasonal facials, massages and wraps, luxury manicures and pedicures, complementary therapies, pregnancy and sports massage. Signature treatment: Journey Through the Seasons is a 180-minute bespoke mix kicking off with a soothing foot soak and scalp massage, plus your pick of a special facial, body wrap or scrub, as desired. Spa products: Elemental Herbology is an organic treatment range rich in healing plant and marine minerals. Journey Through the Seasons is a 180-minute bespoke mix kicking off with a soothing foot soak and scalp massage, plus your pick of a special facial, body wrap or scrub, as desired. Elemental Herbology is an organic treatment range rich in healing plant and marine minerals. 78 Deluxe Rooms; 2 Disabled Rooms; 12 Junior Suites; 4 Deluxe Suites. 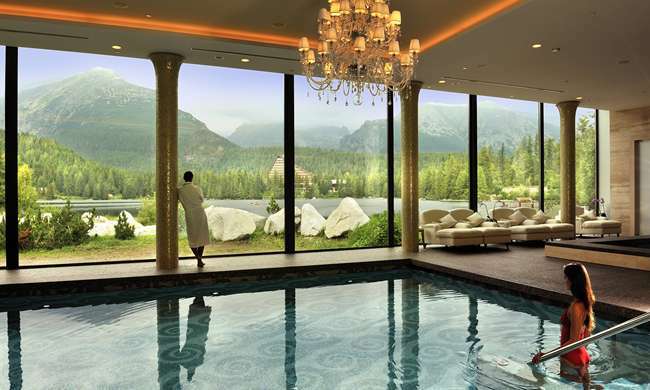 The Grand Hotel Kempinski High Tatras is 165kms from Krakow international airport, transfer time about 3hours, and 0.5kms from the nearest train station Štrbské Pleso. The food and Slovakian wines are too irresistible for dieting, although you can opt for the tasty ‘lighter’ Wellbeing menu if you must. Five-star spa and hotel in a peaceful lakeside setting, with views of the High Tatras to the lakeside; Low Tatras to the hotel’s front. Nearest airport to the sister hotel, Kempinski Hotel River Park is Vienna International airport with an hour taxi transfer.